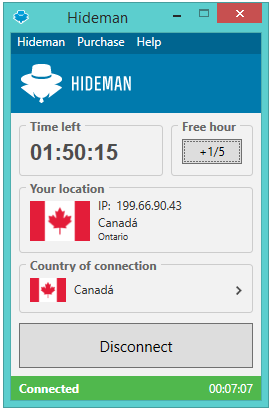 Hideman VPN is one of the lesser-known UK-based providers that’s been on the market since 2012. By now they’ve expanded their server network to 22 countries including the USA, the UK, many European countries, Singapore, Malaysia, Russia, Turkey, Hong Kong, and Australia. As you can see, the network isn’t huge, but each location is strategic. They use 256-bit encryption, PPTP, LTP, and OpenVPN, offer an intuitive cross-platform client, free no-registration trial, competitively priced paid plans, and even a Warrant Canary page. Hideman offers a free trial limited to 7 hours, and after that, you can get 4 hours weekly for free. No registration is required, but once the countdown begins, it goes all the way down to zero even if you force-close the app from the Task Manager. The free app doesn’t let you connect to the US or UK servers, as well as another dozen of “interesting” servers, and caps your speeds (512kb/s). These draconian limitations beat the purpose of a free trial, especially if you’re looking to unblock streaming sites like Netflix US or BBC iPlayer. Mobile kicks in at $2.9 per month or $24.9 per year. Ultimate, which covers up to four simultaneous connections on Mac, Win, Linux, and mobile + browser extensions, will set you back $9 a month or $69 if billed annually. Private covers all platforms, but lets you choose the location you need at the cost of $9 per month. The program is intuitive and comes with embedded Help tab that gets some of the fundamental questions out of the way. Support is ticket-based, but you can also try to reach them via Skype and Jabber. Just mind they’re available during office hours. 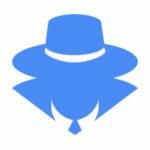 Their FAQs section may not be the largest VPN knowledge base out there, but it covers the most important concerns right out the door. 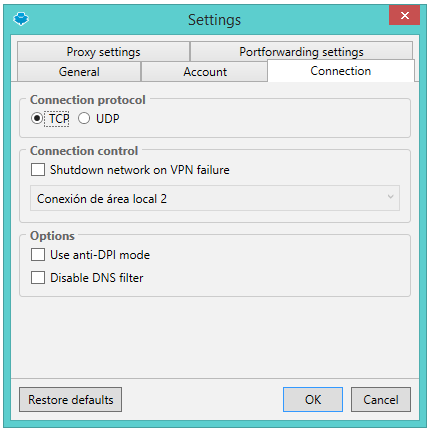 There is a toggle to switch between TCP/UDP, enable a kill switch, use anti-DPI mode, and disable DNS filter. Other than that, the free trial is limited to a dozen of servers I couldn’t find a use for, as my primary objective was to get unfettered access to the US and UK servers. With the limited number of servers to choose from, I decided to pick the obvious Canadian servers for proximity, and then test a couple of EU-based locations. While the Canadian server showed an acceptable decrease in speeds, the European servers resulted slow to the point of useless. The app failed the DNS leak test but passed the WebRTC and IPv6 leak tests with anti-DPI mode enabled, and DNS filter disabled. What do I make of these results? The free version limits the speeds, ok, but it doesn’t justify the poor performance of the EU servers. The provider claims the paid service is great for torrenting and streaming, but the free trial fails to persuade. What I did like was the way the desktop app marks locations where torrenting is illegal, so understandably, they block P2P for servers in the UK, USA, Canada, France, Germany – you get the idea. The site lists 19 media streaming services the paid VPN can unblock, including Netflix and BBC iPlayer. I figured those living in France or Germany might as well put it to good use to bypass some ridiculous YouTube restrictions. Still, the free version was supposed to help me make a decision on whether it works for me, which it didn’t because the US and the UK servers are locked. P2P is allowed, and the FAQs conveniently list the P2P-friendly locations. Hideman relies on OpenVPN (with support for PPTP and L2TP/IPSec), and 256-bit AES encryption backed by RSA-2048 or DH-2048 (IPSEC), which is good. The apps come with a kill switch, DPI protection, and a toggle to disable DNS filtering. They get special kudos for keeping a Warrant Canary page, but is it enough to make up for a UK jurisdiction, with its draconian data retention laws and mass surveillance? You decide. Hideman VPN might be a feasible VPN solution as it offers a sleek cross-platform client that spells the promise of a decent performance. It’s basic enough to be easy for the most technically-challenged, yet provides a few nifty tweaks like the kill switch and the DPI protection. It allows P2P and streaming, but unfortunately the free version doesn’t let you get a test drive with Netflix and BBC iPlayer. The potential is there, but the free trial didn’t persuade me to commit to a long-term relationship.